Thebarton Theatre, 10 June 2018. Jimmy Barnes is a singer/song writer many Aussies have grown up with. He's from that generation of seventies and eighties Aussie rock that grew out of the Australian Pub scene, where many of our most famous musical artists began. In recent times Jimmy has written two books about his life, Working Class Boy, and Working Class Man. I will confess I haven't read either, but I did buy both books for my partner who is a far more of a Jimmy Barnes fan than I. Almost quite by chance I saw Jimmy was touring his second book as a show titled Jimmy Barnes Working Class Man: An Evening of Stories and Songs. I figured if anyone had interesting stories to tell it was Jimmy, and I knew I'd get heaps of points with my partner if we booked tickets to go. This particular show was the last one of his national tour at the Thebarton Theatre in Adelaide (basically his home town). Jimmy is just as engaging talking about his life as he is performing his music. If you decided not to go to the show because you already read his books then you really missed out, and, if you love his music, why wouldn't you go to see him perform? The word 'songs' is right there in the title? Working Class Man pretty much covers his entire musical career from how he started with Cold Chisel right up to his latest music - he closed this particular show with an all new song. In between Jimmy talking and singing we got video highlights with his pre-recorded narration. 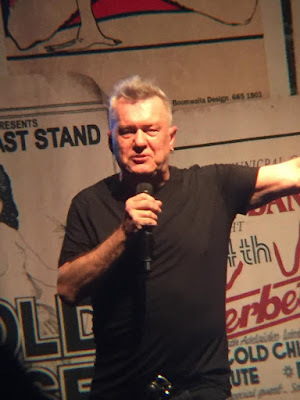 At various points, such as when he showed Cold Chisel's very first music video, on stage Jimmy would talk about, and point out, various things of note about the clip. From my point of view I found the whole show very interesting and enjoyable. By his own account, it's incredible Jimmy is even still around to tell his story given the self destructive life style he lead right from the start and well into his later career too. If I have any criticism at all, I'd say the volume on the live song performances was just a little too loud. To my ear it sounded like the speakers weren't coping with the loudest parts of songs, but that may just be me. I'm not a huge fan of live music when it's so loud you can barely distinguish the lyrics from the instruments. That said, Jimmy was true to his word of always giving his all to every performance. Even when singing songs like Working Class Man, which he must have sung thousands of times by now. I was surprised he didn't sing more of his hits live, rather than delegating some of them to the video but I wasn't disappointed. It was a three hour show and I feel he probably barely scratched the surface of what he wrote in the book. If he'd included singing more of the hits it would probably have added another hour to the show, he's had so many. In closing the show he highlighted the issue of Men's Mental Health, which was very relevant to the entirety of his story and his own struggle with self destructive behaviour. He also made the point that while he was doing much better these days he still has work to do in that regard. Delivering that message did bring the mood into a more serious zone than the rest of the show for a moment but it was a message well worth sending the audience home with. Though, thankfully he did lighten the mood with that all new song I mentioned earlier. If Jimmy ever does any kind of speaking tour again, I would highly recommend you buy tickets. Sure it's great to see him rock out but he can certainly tell a story too - and I bet he's got some good ones still to tell. Don't miss him next time he's in your town.